This may be traditional but it’s a crap cocktail. 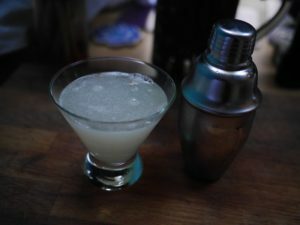 You can do much, much better with fresh lime juice and simple syrup (i.e. make your own cordial). There are more recipes on the wikipedia page here, but my recipe is even better. Gather your ingredients. 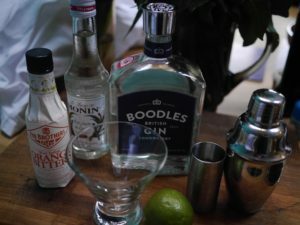 Always use a decent gin that you like enough to sip neat — Boodles here works well, but I’d use Bulldog if I had some. Even though there’s a strong citrus flavour, the wrong gin will give a soapy undertone. The other ingedients are the juice of a fresh lime, simple syrup, and my special ingredient — orange bitters (Fee’s here). There are a few ways to serve. An Old Fashioned glass works fine, but a conical martini-style glass is better to smell the fresh lime with the orange and gin aromatics. 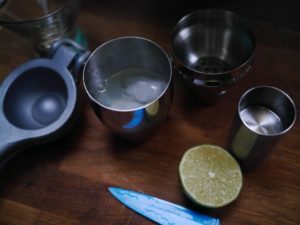 Just combine the gin, juice, syrup and bitters in a cocktail shaker with ice and shake hard. I reckon you want to aerate the cocktail, which will change the mouth feel and aroma. When you pour there should be a little foam on top. You could scoop out some ice at the end and float it in the drink if you want. Hold the glass by the base.